it's my girls' world: Solids! Yesterday was also Anjali's 1/2 birthday. I love the six month mark as I think the rules are relaxed a bit--- if I need to, I can start formula (according to Health Canada); I don't have to sterilize everything; she can get limited amounts of sun and wear sunscreen; the toys are WAY more fun; they become their own little people and most importantly they can begin eating. I loved preparing baby food for Cassia. I believe in giving myself and my family real food and not processed stuff... so i stayed away from most of the jars of baby food. It's really not that much more work and to me the benefits far outweigh any trouble. So once again, I will do the same with Anjali. 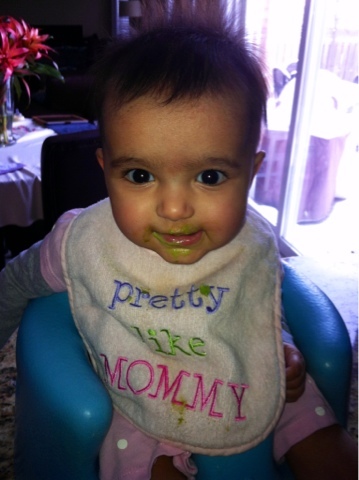 Full disclosure, with Cassia, I began solids just before the six month mark as I was so excited. But with Anjali, we wanted to be super careful as we find so many second babies have allergies. We began with avocado as we did with Cassia. I was so excited so I fed her right after her morning milk. Big mistake! She ate a couple spoons of the avocado but then started to gag and promptly threw up... lots. Today was better though. I fed her at 11 after her mid-morning nap and she ate out her entire bowl (not much, 1 avocado is about eight servings for a baby). We've also started rice rusks as a snack and she chowed down on two of those... We may just have another foodie on our hands! This picture is from today... no one likes to look at vomit.